In her first solo show in New York, Krantz will present a large scroll painting and new works from her recent residency in Holland. 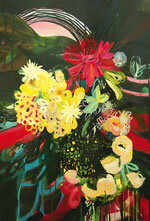 Katy Krantz is a young painter whose work is graced with a pleasing insouciance. 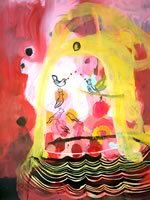 Utilizing bold strokes she paints abstracted mounds of flowers and birds in a dizzyingly vivid palette of pinks, reds, turquoise, and yellow over fields of black. Working intuitively, Krantz is a painters' painter creating images poised in a balancing act contrasting broadly gestural mark making with delicate linear drawn passages, transparent glazes with thickly opaque sections. 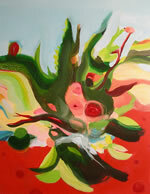 The divergent surfaces and color point to the inner mystery of these paintings. Inspired by her travels to Mexico and Brazil, she conjures a world at once playful and vaguely ominous. Writing of her work she has described an interest in the use of mounds of flowers in mourning, in the juxtaposition of the naturally beautiful with death and sorrow. Krantz's work springs from an engagement with the meaning of this hopeful gesture and becomes one itself as stroke upon stroke of bright color are laid down forming her tangled piles. If, as she suggests, these works are to be read as memento mori, then they are of a refreshingly optimistic variety. Like the dancing skeletons of the Mexican Dias de los Muertos, these paintings recognize death but rush to embrace life. 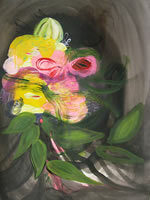 Katy Krantz has exhibited her work throughout Southern California and in Mexico. She is currently an MFA candidate at Hunter College, NY.